A great beginner puzzle designed for wet or dry food. If your cat is just starting out this is an excellent toy to teach them the game. Another great beginner toy that can be used for wet or dry food. This is a stationary puzzle that hones your cats paw fishing skills! A more intricate food puzzle with multiple components. 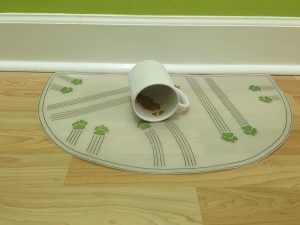 Wet cat food can also be used in the wells making it a versatile and challenging game for your cats. This toy is for the experienced forager! Wet food foraging can be a great way to slow down voracious over-eaters that later vomit their canned food meal. This stationary foraging board is fantastically versatile. In this clip Samson is demonstrating how the tongue module exercises their tongue and jaw muscles!